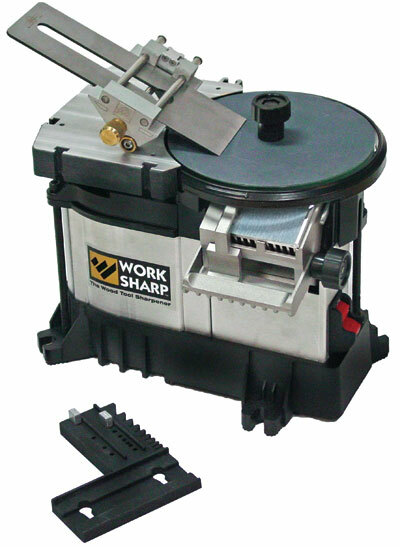 The usual arrangement for sharpening is to move a chisel in a controlled way over a dead flat abrasive surface. The WorkSharp does the opposite. 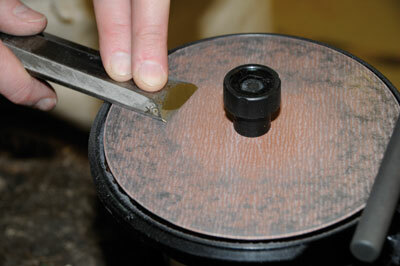 A dead flat abrasive is moved over the chisel! I must admit that I was sceptical when I unpacked the box. The motor unit has a vertical spindle onto which toughened glass discs can be mounted. A series of graduated-grit self-adhesive abrasives is supplied which can be stuck to the glass. 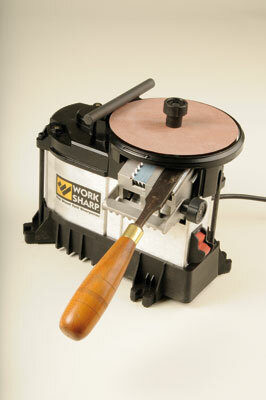 The tool to be sharpened is offered to the disc from either side. There is a small toolrest bar on the top and an adjustable registered tool holder on the underside. 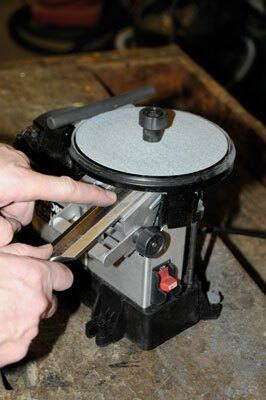 Two other surfaces are available, to be used in place of the glass disc, a leather stropping disc and a pierced disc which allows the user to see the edge of the chisel being ground. I used the strop but not the 'edge-vision' pierced disc which, it is suggested, would be used for carving and turning tools. This facility is unique and we look forward to testing it for our sister magazine Woodcarving. I produced a bevel very quickly using the below-disc tool holder. It has preset angles of 20 degrees to 35 degrees in 5 degree increments, and a fine-tuning skew adjustment by which the squareness of the edge can be adjusted. The disc has to be changed frequently to go through the grits, but this turned out to be easier than expected. It was also necessary to clean the abrasives, but once again this was easily and cleanly achieved using the crepe block supplied. Things were looking good. The time taken to clean and change the discs gave the chisel time to cool down. The discs revolved at 580rpm so there was some heat build-up which one needed to be aware of. The unit does have an air duct and a heat sink, both of which help to prevent overheating, but I found the best solution was to use a finger to test the temperature. Once it got too hot to touch I stopped. 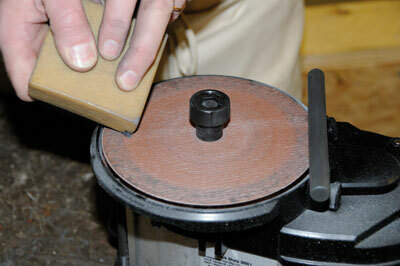 The manual does suggest that small chisels are ground towards the centre of the disc where the speed is slower. One tedious task with edge tools is lapping the back, and the flat discs made a very good job of this task. For this operation heat build-up was a big concern and I had to be very deliberate about letting the heat dissipate. Bearing in mind that lapping doesn't happen that often it is possible to conceive that lapping can be interspersed with other tasks which will produce intervals during which the tool can cool naturally. I don't like the old idea of cooling the tool in a tin of water because this action might produce micro-fissures. The angle at which the chisel is offered for lapping is crucial. The tip must be the last part of the chisel to touch the grinding surface and the handle must never come up otherwise you will curve the back of the chisel. Once I had perfected the technique it worked very well. This system works well, but care is needed because the speed at which things can go wrong means that misuse would result in failure. However, the thorough and informative instruction manual highlights these problems and it should be followed precisely. I'm looking forward to carrying out a long-term test. "A few carefully selected types are of great benefit in a western workshop"